Everybody thinks on occasion about a moment, or two, or a thousand, in their lives that they would change if they could. How things would have been better if they had or hadn’t done something. But people rarely imagine going back in time to change the lives of millions – we just don’t really operate on that level. I’m not surprised that Stephen King does, though – he’s really not like most people, now, is he? In 11/22/63 he has his character going back not into his own past, but into a past before he was born, where he has an opportunity to change everything. Jake Epping is an English teacher in a small town in Maine (no surprise there). He’s recently divorced, reasonably happy with his job and about to start his summer vacation when he gets a surprise call from the owner of a local diner. He knows Al Singleton, but not well. Curiosity and the intensity of the man’s request find Jake paying him a visit at the closed eatery. Shock replaces curiosity when he finds Al extremely ill and seemingly aged overnight. Literally overnight. The story he has to tell is one of time travel, history, opportunity and the chance to correct one of this country’s greatest wrongs. He thinks Jake is the man to complete what his health has made impossible. Jake is just plain freaked out. As always, Stephen King is at his best when he has the time and the pages (about 800 of them in this case) to allow his characters to really develop and grow and deepen into people we feel like we know. His heroes are typically a little better than you might expect from the average human being, more honest, upstanding, trustworthy and noble. That’s Jake and as usual it serves the story well. We’re going to spend a lot of time with this person, we need them to be better than reality – we need to invest completely in their world and their success. Jake is a good man by any definition, and a perfect King hero. There are two things that make 11/22/63 really work, beyond the beautifully written characters. There’s the premise – going back and changing a huge cultural event, and there’s the journey – Jake has to stay in the past for over four years in order to get that chance. King takes the assassination of JFK and wraps a whole world around it, from Jake to everyone he encounters and the past itself which seems bent on maintaining the status quo and not allowing an interloper from the future to interfere. From the moment Jake steps back into the past for the first time we’re dipped into a world of sweet nostalgia with bitter, ugly undertones that remind us that the past was not like the images we see on old television shows or picture postcards. Jake rolls with the good and the bad, learning as he goes how things worked in 1958 and how things work in his own crazy world of time travel. The journey is long and in that time Jake makes a life for himself – he doesn’t have to do so, but he finds himself unable to simply mark time. Of course that complicates everything, but changing the past is tricky business – there are going to be complications. That long wait, from his entry into 1958 until November of 1963, form the heart of the book and the journey. This is where the bittersweet nostalgia is strongest, where we invest in our hero as well as his new friends. We meet Lee Harvey Oswald and he’s more than a paper cut-out of a bad guy in history class. King did his homework and makes Oswald and his family into real, complicated characters. 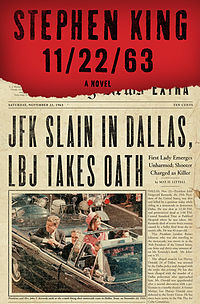 11/22/63 is a tome. It’s a huge book and a real time investment for anyone who chooses to pick it up. It isn’t a horror novel, in the way one might expect, but it has definite King-ish features that add some weird zing to the time travel motif. For any King fan, anyone who lived through the late 50s and 60s or any student of American history, 11/22/63 has a lot to offer. It’s a commitment to dig into something so vast, but it’s King’s best book in years and definitely worth the ride.